LONDON -- In recent years, Serena Williams has been prone to slow starts, particularly against far lesser players. And in some of those matches, she never recovered. On a glorious sunny afternoon at the All England Club, Russian Elena Vesnina stepped onto Centre Court, the latest potential banana peel hoping to trip up the No. 1-seeded Williams. This time, the 34-year-old Serena did not slip. Not even close. Serena Williams beat Elena Vesnina in only 48 minutes, the shortest completed match of the tournament. 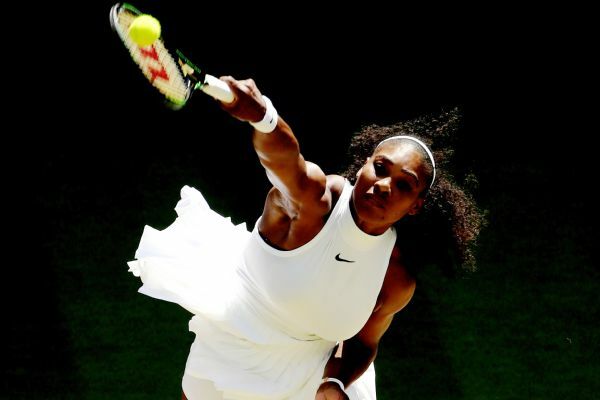 With the calm, measured performance of a six-time champion, Williams completely unstrung the unseeded Vesnina 6-2, 6-0 to advance to her ninth Wimbledon final (Saturday, 9 a.m. ET on ESPN/WatchESPN). It was clinical, almost cruel. "I felt like I had no chance today," Vesnina said later. "She was in a great mood, and her serve was working really well for her. She had a really high percentage of first serves. She was placing it amazingly." Said Serena in her postmatch BBC interview: "I was really focused today. I was ready. It's never easy out there. Every point you have to fight for." Really? It sure didn't look that way on Thursday. Match time: 48 minutes -- in the semifinal of a Grand Slam, no less. It's been 17 years since a semifinal was over that swiftly. You had to feel for the shell-shocked patrons at Centre Court, who paid 126 pounds ($164) for the privilege of watching. It was over so quickly that organizers delayed the start of the second semifinal to ensure that all spectators had a chance to arrive, causing a murmur to ripple through portion of the crowd already in attendance. The only drama after that emphatic result: Would Serena play her older sister Venus or No. 4 seed Angelique Kerber in Saturday's championship match? It turned out to be Kerber, who had upset Serena earlier this year in the Australian Open final. "I felt like she played great," Serena said of that match. "She came out swinging, ready to win. She was fearless. That's something I learned. When I go into a final, I, too, need to be fearless like she was." The numbers were almost unreal: Serena lost only three points on her serve in the entire match, winning 28 of 31 points. She was a perfect 12-for-12 in the second set. Sixty-one percent of those serves (including 11 aces) did not come back. All told, Serena won 53 of 74 points, a beatdown of ridiculous proportions, considering the stage. "This is the best we've seen her from start to finish all year," said U.S. Olympic coach and ESPN analyst Mary Joe Fernandez. Vesnina, to her credit, had been an overachiever here. She began the year ranked outside the top 100 and, just short of her 30th birthday, had climbed back to No. 50 with her best career result in a Grand Slam. Oddsmakers installed her as a 14-to-1 longshot, which in retrospect seems a tad optimistic. Serena has now been the WTA's No. 1-ranked player for 177 weeks in a row and seems destined to break Steffi Graf's record of 186 consecutive weeks on top. The other Graf milestone, however, is the one she really wants. After failing to win the past three majors -- losing in the finals of this year's Australian Open and French Open -- Williams still finds herself one victory shy of Graf's Open era record of 22 Grand Slam singles titles. Now she's only two sets away. "I think for anyone else in this whole planet, it would be a wonderful accomplishment," Serena observed. "For me, it's about obviously holding the trophy and winning, which would make it a better accomplishment for me. "For me, it's not enough. But I think that's what makes me different. That's what makes me Serena." The fact that she's doing this at 34, closing in on 35, is extraordinary. She's already the oldest woman to win a major in the Open era, a feat she accomplished here a year ago at the age of 33. And now she can extend that record by another year. In a moment typical of the match, Vesnina was serving at 0-2 in the second set, down a break. Her second serve was clearly wide, but she challenged. Even when the replay showed the ball several inches wide, she seemed perplexed and stood still for a while longer. Afterward, you had to laugh. "I think [Vesnina's] saving herself for doubles," John McEnroe cracked during the BBC broadcast, referring to the quarterfinal match in which Vesnina and partner Ekaterina Makarova are scheduled to take on the Williams sisters. Serena didn't sound like someone content to merely approach the finish line. Those losses to Kerber in Melbourne and Garbine Muguruza in Paris -- especially now -- are clearly still at the forefront of her mind. "It's weird," Serena said. "I can't believe I'm in the finals again. "Obviously, I'm 0 for 2 [in major finals this year], so I'm determined to get at least one this year."